BBC Business Editor Larry Madowo quit the bachelors’ club on Sunday after tying the knot with Citizen TV news anchor Victoria Rubadiri. The two lovebirds, who have been dating three years, sealed their union in an exclusive wedding ceremony at the Marula Manor in Karen, Nairobi. According to our source, the wedding had 100 guests, most of whom were family members, close friends and colleagues. They were required to leave their phones at the main entrance and sign a confidentiality agreement. This was done to ensure that no photo was leaked to the media. The newlyweds will fly out to Italy on Wednesday for their pre-honeymoon before proceeding to France where they will spend two weeks. News of their nuptials caught many people by surprise since we had all assumed that the Madowo and Rubadiri only had on-screen chemistry. As it turns out, there’s more than meets the eye! The two have dated for three years or so and managed to keep their relationship under wraps. We wish them all the best as they begin a new journey as a couple. To add to that, this a polite reminder that today is April Fool’s Day. If I were you I would not take any of this seriously. 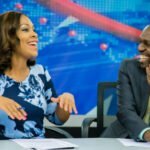 The post Larry Madowo weds Victoria Rubadiri in low-key ceremony (Photos) appeared first on Ghafla! Kenya.